From rural beginnings in the Wisconsin countryside, Samantha Glass spent most of their adult life engrossed in Madison’s noise, power violence and punk DIY scenes. 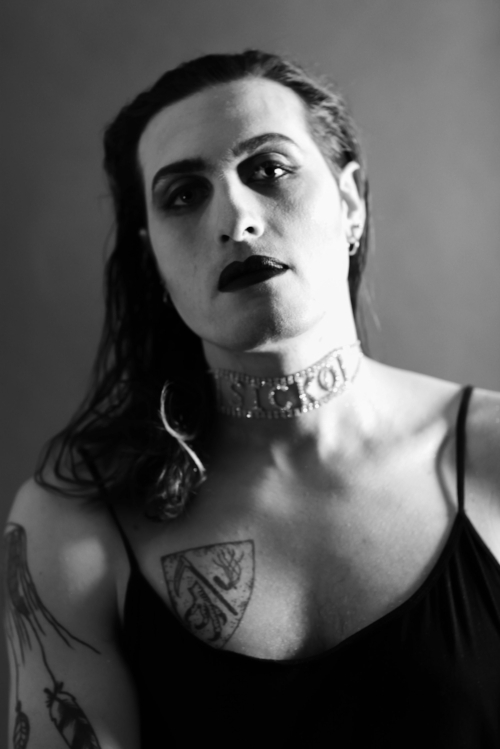 Glass sought to create a balanced form of art representative of their fluid sexuality and gender identity while incorporating elements of darkwave, musique concrète and new age music. Samantha Glass has evolved into an outlet for drag-based performance art coupled with drum machines, cassette loops and down-tempo crooning. Through years of touring and a prolific discography, Glass came to be known beyond the Midwest as one of the most dense and multi-layered projects amongst experimental music spheres. This exploratory essence gives Glass a broad crossover appeal as they narrate a uniquely nuanced perspective on life and art. Now based out of Austin, Samantha Glass untangles their serpentine mind on the ambitious new full length Nine Memories Between Impression & Imprint out October 12, 2018. This week Ms. Glass was nice enough to share two new tracks ahead of the album release date. Click HERE to order your copy of Nine Memories Between Impression & Imprint - out October 12, 2018 on 12" black vinyl, cassette and digital download from Holodeck Records.